Become a Cyborg, Step 1 - the Digital Tattoo Interface | unwir3d: "One of the more notable (and creepy) entries at the Greener Gadgets Design Competition 2008 was the Digital Tattoo Interface. Conceptualized by Jim Mielke, the device is basically an implanted, bio-powered mobile phone. Imagine hearing a ring and rather than reaching for your pocket you roll up your sleeve and press a dot on your forearm. 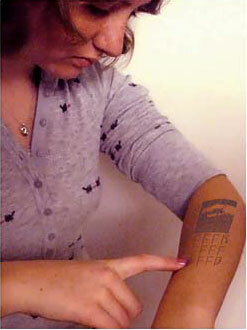 A two by four inch tattoo of a phone's digital display materializes on your skin along with a keypad. The display animates as a digital video of the caller and then disappears when the call is over. In Mielke's mind the Bluetooth device would be permanently implanted beneath the skin. It is basically a flat, flexible silicon and silicone pad that would be tightly rolled and inserted through a small incision. Once inside it would unroll and lie harmlessly between the muscle and the skin. Two tubes would then be inserted, one attaching to an artery, the other to a vein. These would bring blood to and from a coin sized blood fuel cell that would convert the blood's glucose and oxygen into electricity required to power the device. The surface of the implant that faces the underside of the skin is covered with a matrix of field producing pixels that activate a matching matrix of pixels tattooed onto the surface of the skin above the implant. The panel would be a touch screen control as well. Instead of ink, the surface tattoo would consist of clusters of microscopic spheres injected into the skin. Each sphere would contain a field sensitive material that would change from clear to black when the device is activated. Besides functioning as a mobile phone the device could communicate with other implants around the body and could monitor for blood disorders, sugar level, toxins, etc. It would basically serve as a 'human version of the check engine light.'" DISCOVER.com Science, Technology and The Future: "Bad at remembering names? What if all you had to do to remind yourself was center a crosshair on a person’s face and his name-perhaps even his Facebook profile-would pop into your field of view? 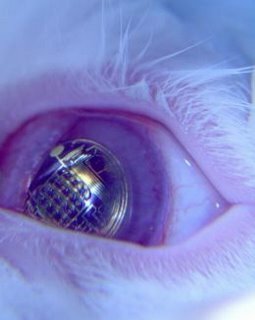 Engineers at the University of Washington have pushed our technologically primitive world closer to this Terminator-esque dream of augmented reality: They’ve manufactured contact lenses that contain electronic circuits and red LEDs-and taken pretty sweet pictures of rabbits showing them off."